This article submitted by Linda Stelling on 12/23/97. A popular item for kids, young and old, this Christmas are Beanie Babies. Beanie Babies came into being in 1993, but it wasn’t until last Christmas they really started making an impression in Minnesota. Ty Incorporated, the company that makes authentic Beanies, typically runs four to five months behind in delivery of orders. Sandy Kaehler at Ben Franklin said the Beanie Babies demand is unreal. “They are always gone in a day to a day and a half when we get a new shipment in,” she said. From April to December, the store has sold 1,350 Beanie Babies. Kaehler feels part of their popularity comes from the fact they are inexpensive, $5, which kids can afford. “Plus they are cute, each has a name and birth date which kids and adults can relate to,” she added. “Only 12 Princess Beanie Babies are being alotted to individual businesses,” Kaehler said. Ben Franklin has a dozen. Four are being raffled off on Dec. 30 at Ben Franklin, Community First national Bank, Paynesville Office of the Melrose Credit Union and Farmers and Merchants State Bank, with proceeds going to the Community Service Center. Names are being taken for the remaining six. Those names will be drawn and the Princess Beanie Babies will be sold to the lucky individuals. Sandy Kaehler said they tried ordering more Beanie Babies two weeks ago and were told they are not taking any more orders. Brenda Lehmkuhl, co-owner of Flowers by Us, Richmond, said they have people calling to see when the next shipment will be in. “We had a dry spell this summer when we didn’t get any for a while. Then all of a sudden we received shipments three weeks in a row,” Lehmkuhl said. She estimated they have sold close to a 1,000 Beanie Babies a month. “We have about a dozen collectors who watch for the shipment of new Beanies,” she added. 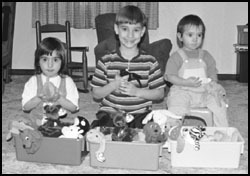 Sarah Ringstad, Paynesville, has more than 60 Beanie Babies. She received her first Beanie Baby last Christmas and thought they would make a fun item to collect. Among her favorites are Valentino, the white bear with a red heart; Claude, the tie dyed crab; turkey gobbles and the 1997 Teddy. “I try to keep up on all the latest ones,” she said. She buys the Beanies with money she earns babysitting. “I look for things wrong with the Beanies because that might make them more collectible,” she added. Her biggest concern is they don’t fade or get dirty. She stores her Beanies in a plastic tub in her room. Ringstad’s mom is trying to prevent her from buying more Beanies until after Christmas. She has hinted there might be more under the Christmas tree. The three children of Robert and Jennifer Mrozek, Lake Henry, trade their Beanies back and forth with each other. Each child has a small bin filled with Beanies. Brutger, 6, says they are fun to toss around and play with because they are soft and filled with beans. Katelyn Mrozek, 1, won two Princess Beanies last week, one from Ben Franklin in Paynesville and the other from a store in Belgrade. Ty has about a 100 animals in all. Every four to six months, Ty creates new Beanie Babies. Since their creation, 45 of the Beanies have been “retired,” or are no longer being made. Retired Beanies start at $60 on the secondary market. Collectors have drive up the prices of retired Beanie Babies from their original retail cost of $5 to as high as $2,300. By retiring a number of Beanie Babies every year, Ty gave birth to a second craze—the Beanie Baby collectors’ market. A Beanie named “Peanuts,” a royal blue elephant, lists for $1,500 in the secondary or resale market, but only if he’s royal blue in color. Peanut, the light blue elephant, is worth only $5. A Beanie called “Spot,” who was made in several different styles, goes for $900 without spots. Likewise, “Quackers,” a duck sold with and without wings, goes for $975, wingless. How powerful is the Beanie Baby phenomenon? McDonald’s so under-estimated the demand for its “Teenie Beanies” giveaway that it ran ads apologizing for shortages. They gave away 100 million Teenie Beanie Babies in less than a week. The Chicago Cubs recorded their highest attendance of 1997 on “Beanie Baby” give away days. Anyone interested in more information on Beanie Babies can check out the new book “Beanie Mania: A Comprehensive Collector’s Guide,” by Becky Phillips and Becky Estenssoro, published by Dinomates Inc. in Naperville, Ill. It is packed with information, photographs, descriptions, charts and a full history of the evolution of Beanie Babies. It contains current and historical pricing information, and the authors have long been considered the most accurate arbitrators of how much any particular Beanie Baby is worth. The book can be found at bookstores, gift stores and specialty shops. It can also be purchased by calling toll free, 1-800-247-6553.